Looking for a delicious new new way to dress up butternut squash? 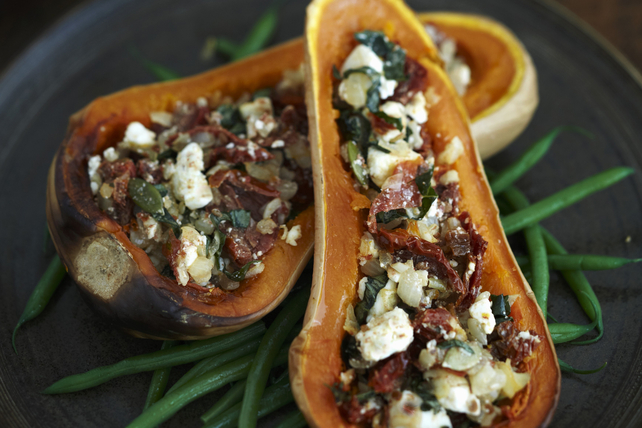 Then, you'll want to try our Stuffed Butternut Squash with Feta recipe. This wonderful side dish features roasted butternut squash that's topped with sun-dried tomatoes, crumbled feta cheese, toasted pumpkin seeds and fresh basil. Place squash halves, cut sides up, in 13x9-inch baking dish; top with butter. Bake 50 min. to 1 hour or until squash is tender. Meanwhile, heat dressing in medium skillet on medium heat. Add onions and garlic; cook 5 to 7 min. or until onions are crisp-tender, stirring frequently. Remove from heat. Stir in tomatoes. Let stand at room temperature until ready to use. Add cheese, pumpkin seeds and basil to onion mixture in skillet; mix well. Spoon over squash. Bake 10 min. or until heated through. Prepare using Cracker Barrel Crumbled Light Feta Cheese.